While I know April 1 is one day we're all designed to immediately ignore due to countless pranks and jokes being played on the general public, Zynga has come out in style this weekend with a FarmVille "prank" of sorts that you'll definitely want to pay attention to. For the next 12 hours only (as of this writing), you'll be able to plant a new, but extremely limited crop on your farms: Stallion Flowers. This Stallion Flowers crop is real, it does come with a mastery sign, and it can be planted like any other. It also just happens to see you planting stallion foals that grow up into adult horses with tons of flower accents. A single square of Stallion Flowers costs 20 coins to purchase and takes just two hours to grow (so I hope you have plenty of time to check on these foals throughout the day). You'll receive 43 coins when harvesting the Stallion Flowers, but let's face it, growing them is more for the novelty and that extremely limited edition crop mastery sign. Speaking of mastery, the first star comes at just 150 harvests, so if you play your cards right and plant these Stallion Flowers simultaneously across all of your farms, you shouldn't have any problem mastering the entire crop within the 12 hours allotted. Just make sure to not let any of them wither and you'll do fine! Good luck! What do you think of the Stallion Flower in FarmVille? 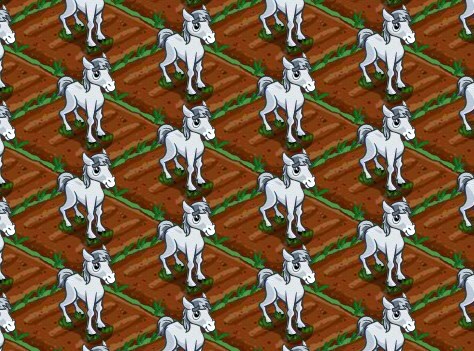 Are you disappointed by FarmVille's April Fool's "prank" this year? Sound off in the comments.